Do you own or manage a History or Family History website? Are you looking for ways to earn money for all of the hard work you have put into your site? Look no further! 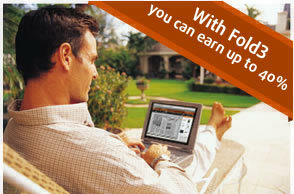 The Fold3 affiliate program is just what you are looking for. When you place our banners and text links and other creative units on your site, or promote our products via email or search engines, we reward you by revenue sharing with you! There are many history and family history affiliate programs available on the web, but none offering the service, linking options, and most importantly pay out rates comparable to the Fold3 program. Interested? You can join now, or browse our FAQ to learn more about our affiliate program and how you can receive a check from us soon!